More than just for gym-junkies on a quest for bigger biceps – protein is vital for a healthy mind and body. Our Perfect Protein is not only an exceptional protein powder, but it’s 100% natural and gluten free! Just add milk or water for a convenient, healthy breakfast on-the-go, a snack in-between meals, or an after workout shake. 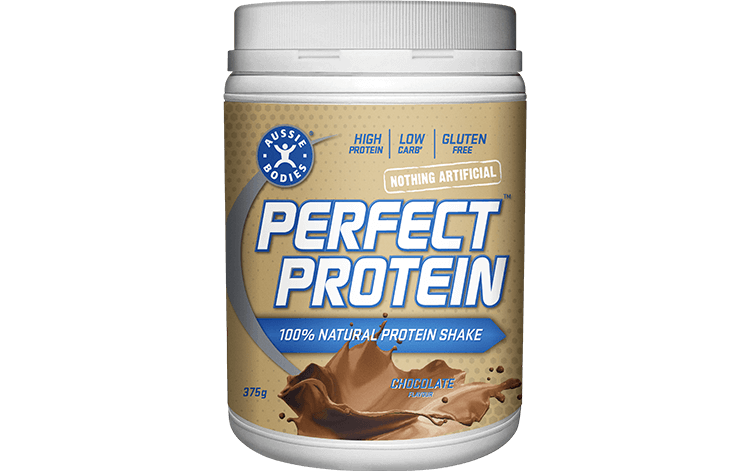 Perfect Protein is formulated with the right nutrients you need to achieve your fitness goals – and keep you looking and feeling great! Ingredients: Aussie Bodies Protein Blend (89%) [Whey Protein Concentrate, Whey Protein Isolate, Emulsifier (Sunflower Lecithin, Soy Lecithin)], Sweeteners (Xylitol, Steviol Glycosides), Flavour, Cocoa powder, Minerals (Calcium Gluconate, Calcium Lactate).